Forestry Tires and Skidder Tires at Pete’s Tire Barns. We have one of the largest inventories of forestry tires in New England offering Firestone, Nokian, BKT and Advance forestry tires. We have a complete lineup of tires for all types of forestry applications with everything from price-value tires to hi-tech radial tires. 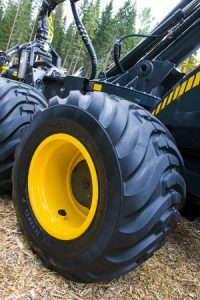 Our forestry tires offer a variety of features including heavy ply ratings, steel reinforced casings and cut and chip resistant tread compounds. Need a forestry tire for use with tracks, we offer a full line of tires designed especially for use with forestry tracks. So whether you need skidder tires, forwarder tires,feller buncher tires, or harvester tires or anything in-between, call one of the Forestry Tire specialists at Pete’s Tire Barns. Which forestry tire is right for you, Bias Ply forestry Tires or Radial Forestry Tires? Radial Forestry Tires – Better Traction, Increased Fuel Efficiency, Less Compaction, Longer Tread Life and a Smoother Ride. We have 19 locations to service all of your forestry tire and skidder tire needs. Call your local Pete’s Tire Barns today and schedule a visit from one of our forestry tire experts.